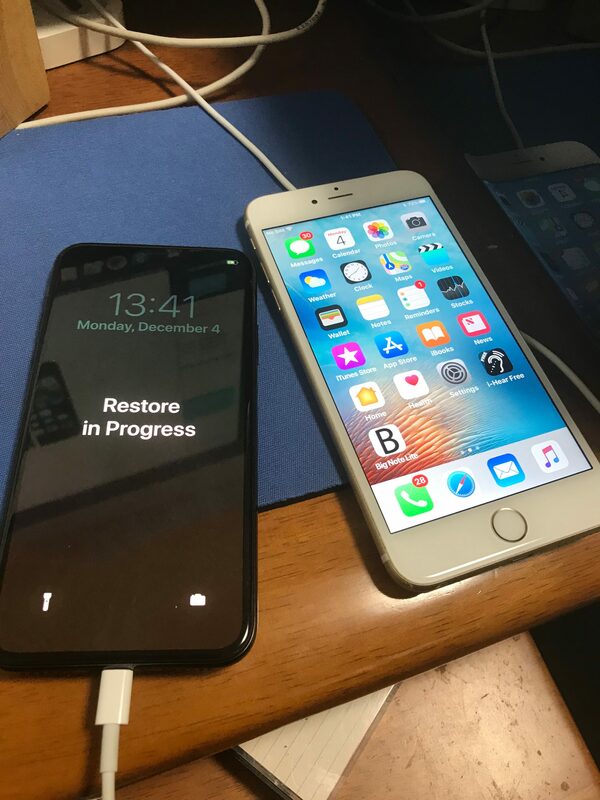 At the beginning of January, due to some special circumstances, I had an opportunity to sell my iPhone 7 Plus and upgrade to a new iPhone X, SIM-free and direct from Apple Japan, with the total cost to me coming to zero. So I went ahead and did it. Usually I always keep an iPhone for at least two years. This is the first time I ever upgraded early. Some things worried me about the iPhone X (e.g. the notch and the mechanical side button). So I was somewhat wary. 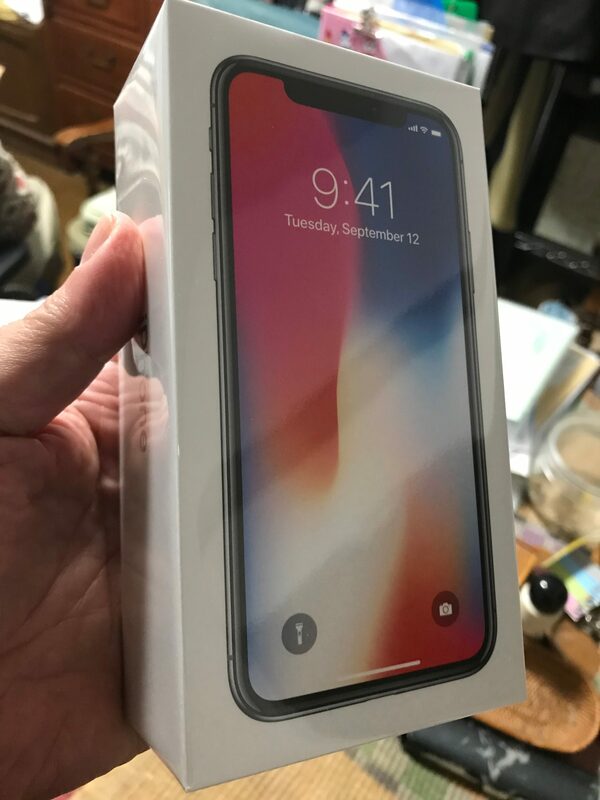 But since it didn’t cost me anything I took the leap and have been meaning to post a review of the iPhone X since then. No Home Button, Gestures, and FaceID vs TouchID. As everybody knows, the iPhone X eliminates the home button creating a display with almost no bezel – a near “full screen” experience. Until the iPhone 7 Plus I often had home button problems because they were mechanical and wore out. With the iPhone 7 Plus the home button became a non-mechanical button with haptic feedback. I thought it was great. With the absence of the home button in the iPhone X you must learn new “gestures” to replace what you used the home button for. And FaceID replaces the TouchID fingerprint sensor in the home button. I found learning the new gestures only took about one minute. The fact you swipe up from the bottom of the screen instead of pressing the home button, or swipe down from the top right to enter the control center is no issue at all. Those gestures are quite smooth. In my opinion it’s also easier to return to the other open application using iPhone X gestures. The way of displaying the open apps is smoother than the double-clicking of the home button. The really nice thing about FaceID is that it gives you an overall smoother interaction with the whole of iOS, and with apps which support FaceID. Here is a simple example of what I mean. Say I want to unlock my iPhone and go into my Commerce Bank account app. With the previous TouchID I need to first press the home button to wake up the iPhone, leave my finger on the home button to let my fingerprint unlock it, open the Commerce Bank app, then rest my finger on the home button again to authenticate myself to the bank. With the iPhone X I just pick up the iPhone and say, “Hey Siri, open Commerce Bank.” Without touching anything, the iPhone X recognizes my face and unlocks, opens the Commerce Bank app, and that app also uses FaceID to authenticate me and log me in where I see my balance. It’s a noticeably more elegant, quick, and smooth operation. 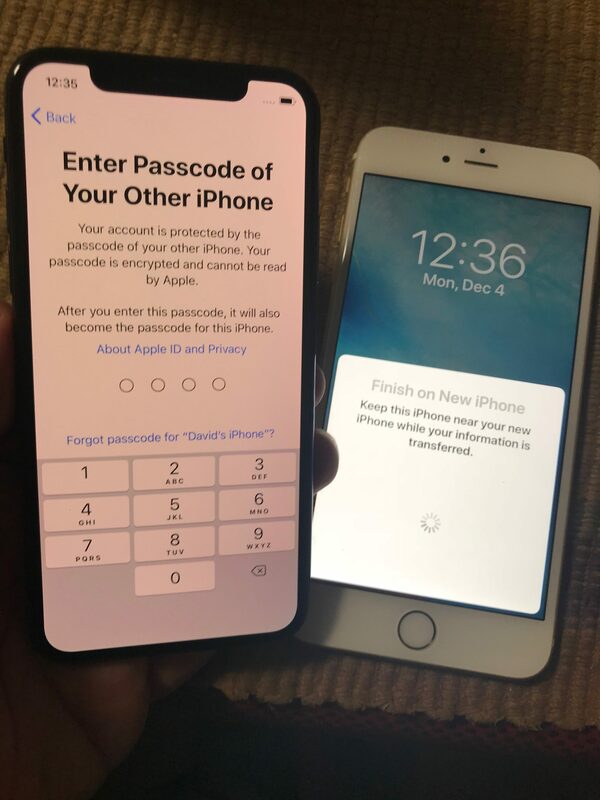 So I would say the absence of the home button, and the general use of FaceID vs TouchID is clever and elegant and an improvement over the home button and fingerprint sensor method. That said, I think the way FaceID is used with Apple Pay to confirm a payment is somewhat awkward. You are asked to double-click the mechanical button on the right side. It’s mechanical. It takes some force. It can wear out. I hope the confirmation is changed at some point to something like a force touch on the screen. However, I find this is a feature I might use once every few days compared to general use of apps, so it’s not really a big issue. One other point is that FaceID itself isn’t flawless. You have to hold it at the right distance or it fails. So you have to get a bit used to it when using your iPhone in bed, for example. This is pretty easy to get used to though. Another point worth mentioning is that I don’t think FaceID is as hard to fool as Apple claims. 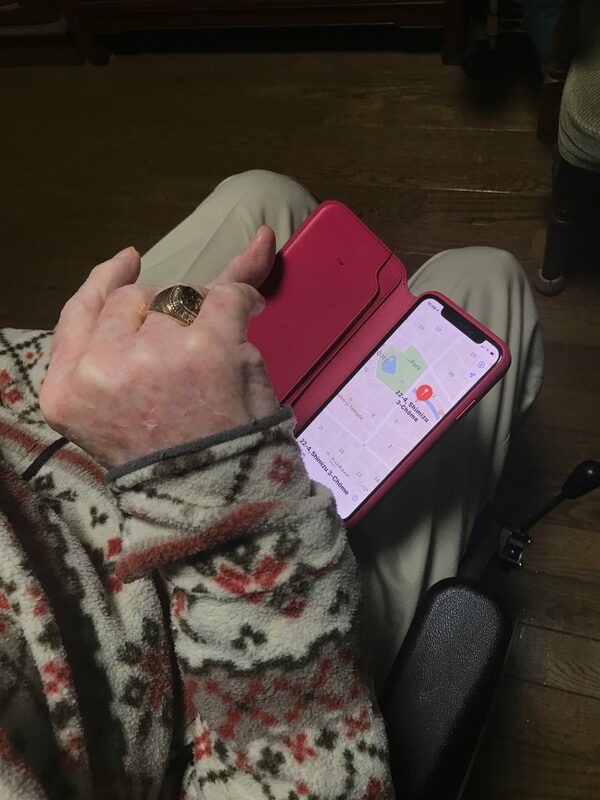 My friend, Dave, also has an iPhone X. The only thing we have in common is that we are both not-so-young white males. I am 62 now, and Dave is turning 99 tomorrow. Yet FaceID on Dave’s iPhone X recognizes me also! I think what happens is that FaceID adapts over time. So if I’m helping Dave with his iPhone X and I enter the passcode correctly often enough that FaceID starts adding data from my face to the stored face so there is some “weird hybrid face” data stored inside. Anyway, I hear from iOS 12 that families will be able to store more than one face, so this is a minor point. The bottom line is that I do like the absence of the home button and prefer FaceID over TouchID. Some of you may have followed my long battle involving the iPhone 7 Plus vs the iPhone 6 Plus displays. I think the iPhone 6 Plus had a brighter and whiter display. I’m happy to report that the new OLED display on the iPhone X is noticeably brighter than the iPhone 7 Plus was. Unlike with my iPhone 7 Plus, I do not need to use the screen at full brightness, even when reading on the train. The OLED does have a blue hue when looked at at an angle, but that is a general characteristic of OLED displays and not disturbing. Anyway, the display is noticeably nicer than the iPhone 7 Plus, and with the settings changed I am happy with the quality and color. Sometimes I feel like I wish that whites were a bit whiter, but generally it’s a very nice display, as long as you don’t use True Tone. This feature certainly was controversial at first. As everybody knows, the iPhone X is almost a full display, but there is a small cut-out at the top in portrait mode for the front camera and FaceID and other sensors. Current technology still requires a non-display area for those features. I would say that 96% of the time I don’t notice the notch, or if I do it looks ok. Maybe 4% of the time it’s a little jarring, like when I open Mail, because the the background is white so the black notch area stands out. Some apps do it nicer, because they either have dark backgrounds, like the Stocks app, or the Camera app, so you don’t notice the notch at all. Some other apps will “letter box” their display area which has the equivalent appearance, just making less use of the display. It helps to think of the display areas on either side of the notch as “extra display space” with extra info (time, wi-fi indicator, battery indicator, etc.) rather than thinking of the notch as a missing area. My overall feeling is that the notch is fine given current technology. And it’s interesting that other smart phone makers are starting to copy that design now. The camera is a slight improvement over the iPhone 7 Plus. It works a bit better in low light. The new “portrait mode” is a stand out feature, letting you create portraits easily with what seems to be studio lighting. I’ve taken some beautiful portraits using that feature. I wouldn’t upgrade from the iPhone 7 Plus to the iPhone X just for the camera improvements, but the improvements are there. Also, with the front camera you can create animated emoji which are fun to try out at least once. In the next version of iOS there will be more animated emoji features. I look forward to trying those. While I’m not an audiophile, I did notice that the speakers on the iPhone X are a noticeable improvement in sound quality over the iPhone 7 Plus, in volume and sound quality. First I was worried because while the iPhone X is often touted as having a larger screen than the iPhone 7 Plus in a smaller body. That actually is only true vertically. With the elimination of the top and bottom bezel and home button, there is much more vertical screen space on the iPhone X than on the iPhone 7 Plus even though the actual size of the phone itself is much smaller. But the iPhone X is a bit narrower. So overall, it has a bit less square inches of display than the iPhone 7 Plus. This has turned out to be a complete non-issue for me. The screen is large and fine. And when I see an iPhone 7 Plus or iPhone 8 Plus they look like unwieldy behemoths. The iPhone X has a smaller body, weighs less, yet has a taller display and almost as much total display space as the iPhone 7 Plus or iPhone 8 Plus. It’s a perfect, very convenient size for holding in my hand or putting in my pocket. My iPhone 7 Plus used to stick out of pockets and looked awkward. It’s hard to imagine wanting a larger iPhone at this point. To me, if I need a bigger display I think that’s when I would use my iPad. I know this isn’t a thorough review. I didn’t go through all the specs. The iPhone X of course has a faster processor, more RAM and more internal storage than the iPhone 7 Plus did. I just covered some of the areas of particular interest to me. Overall conclusion? I love the iPhone X! 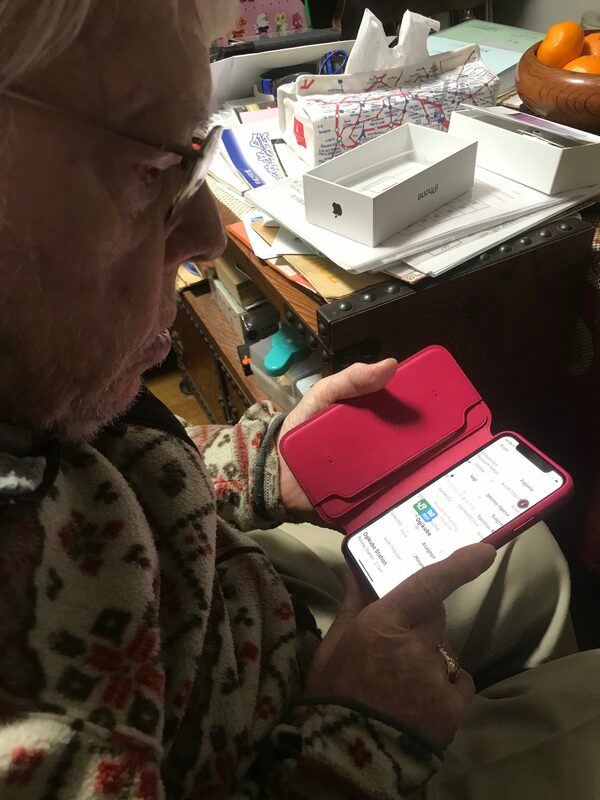 My friend, Dave, got a new iPhone X. I went over to help him set it up and move all the data over from his now “old” iPhone 6 Plus. 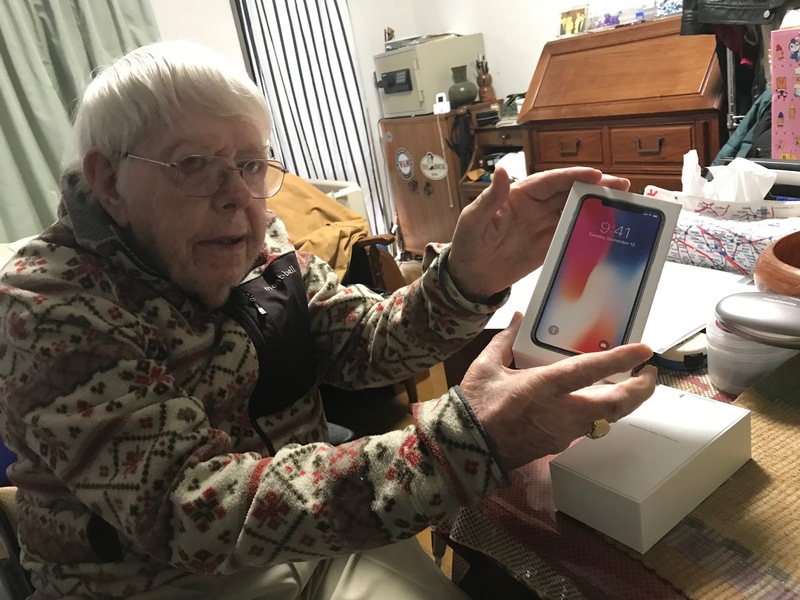 Even at 98 years old, Dave is always excited about getting the next new iPhone. To “sum up” he loves it. And I agree it is really quite nice, and beautiful to look at. Given that, there are some notes I have about the setup, and also the iPhone X itself. So bear with me here. I will be brief. I was really excited to try this new feature that is supposed to let you transfer everything directly from your old iPhone to your new iPhone. But I found it only works in part. Many many things are missing in this process, including all your message addresses, your photos albums, and your music. …So I hooked up the iPhone X to Dave’s iMac, setup as a new iPhone and then restored from a complete backup I made that day. That worked smoothly, recovering everything – over 1,600 photos, all of Dave’s CDs, etc. 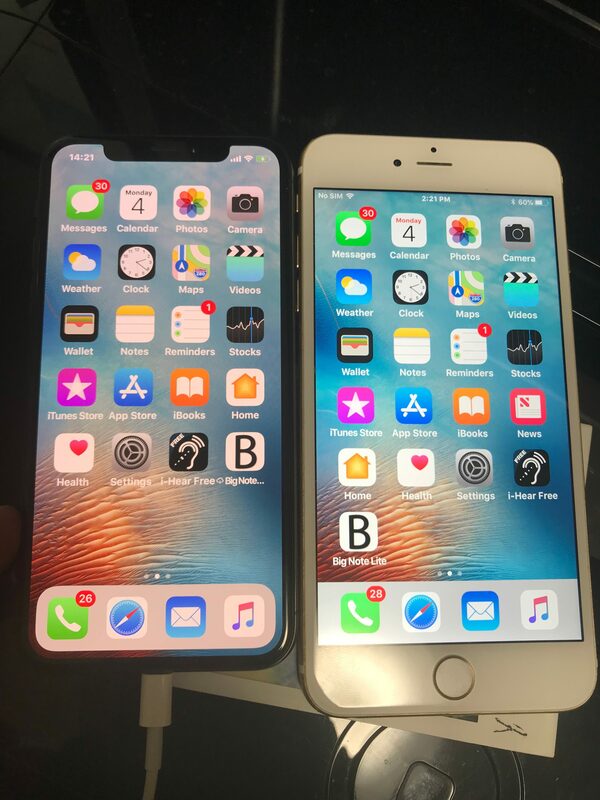 The new iPhone X on the left, and his old iPhone 6 Plus on the right. An important note here! The iPhone X’s default display mode is their new “True Tone” setting, which is a bit “warmer” (yellower) than the old setting. I actually prefer the old setting and would turn True Tone off if I had one. But Dave looked back and forth between the two and said he thought the True Tone setting was easier on his eyes. Dave checking out his neighborhood in Apple Maps. Dave also set up the new Face ID and “Hey, Siri!” and seemed to get used to the new “swipe up” gesture right away, which is what I was hoping for. I did notice something strange about the new iPhone X though, considering that Apple is moving away from buttons. When you download an app from the App Store using Face ID you need to double click the physical button on the side of the iPhone to confirm. It seems ironic that they went out of their way to get rid of the home button, but require a double-click of the side button, which is more awkward, don’t you think? I couldn’t figure out how to confirm the download at first because the message kept on saying to “double click to install” and I didn’t know what they were talking about, because you can’t double-click something on the screen. I had to do a Google search to figure out what they meant. Now the side button performs three functions: sleep/power, activate Siri, and confirm Face ID for purchases. At lease for the purchase confirmation part, I think the non-mechanical haptic touch button on the iPhone 7 and 8 series is easier. Otherwise the Face ID seems to work well, and Dave was able to phone me later. It’s quite a nice phone. And some lucky person at Hibikinokai in need of a smart phone will inherit Dave’s in-perfect-condition iPhone 6 Plus.